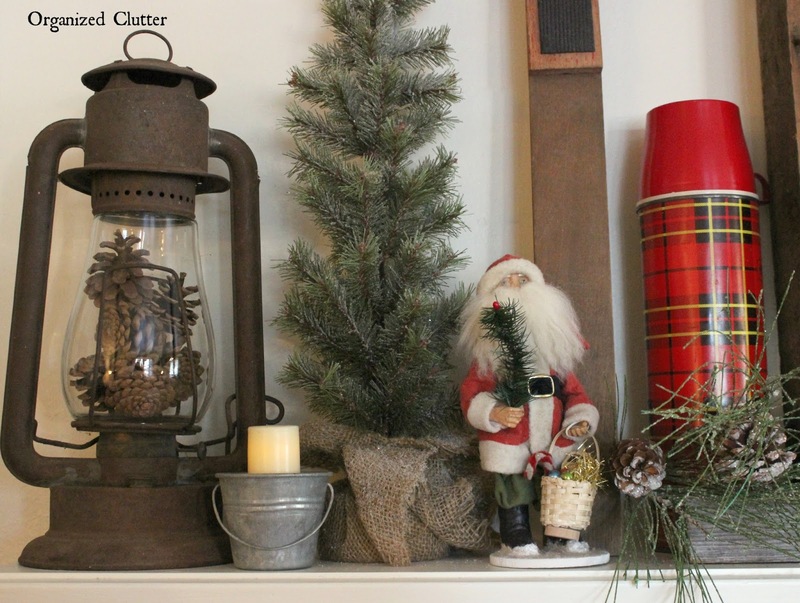 When I decorate a holiday mantel, I love to find one larger anchor piece to build my mantel vignette around. This year it was this old weathered window frame with attached sill. I plunked it right smack dab in the center of the mantel. 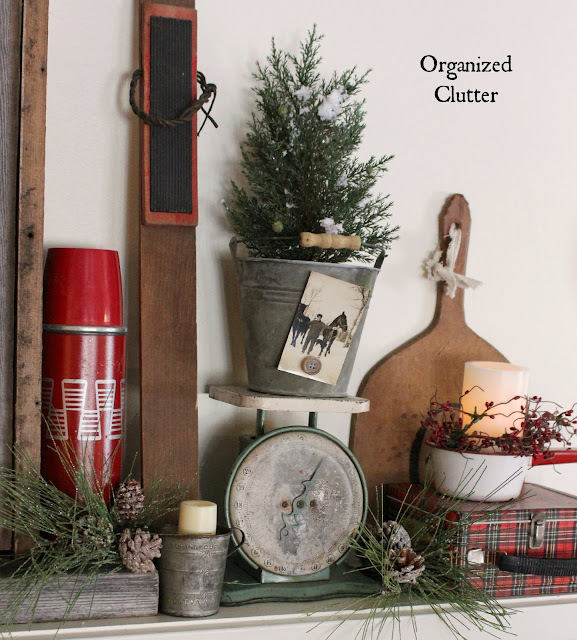 I purchased the "Winter Wonderland" sign a couple weeks ago from my Junkin' Friend Jodi. I proceeded to transform my white mantel into a rustic winter wonderland with an old rusty lantern, miniature galvanized pails with flameless candles, country Santa, winter tree and greenery, antique children's skis, and old thermoses. I added a larger candle ring as a wreath on my "window" with a snippet of buffalo checked ribbon tied on. I use flameless candles on my mantel with timers. Safer and no hassle. More greenery, an old scale, cutting board, plaid lunch box, and an enamelware pot with another candle sit on the right side of the window. This is my great grandfather, Thron. A Norwegian immigrant that settled in Minnesota in the late 1800's and farmed. I love this winter photo! This mantel has nothing fancy on it at all. Just artfully arranged, organized clutter. What's crazy is that the older I get, the less I enjoy this Minnesota "Winter Wonderland". But, it's perfect for a Christmas mantel! A couple of wool knit stockings are hung by the fireplace with care. Here are my 2014 Christmas mantel anchor pieces. See the mantel, HERE. My 2013 vintage toy mantel was anchored by an old metal Kenmore child's stove. See it HERE. My anchor piece for my 2012 Christmas mantel was a red bike wheel. See the whole mantel HERE. Do you build your mantel around an anchor piece? It sure helps give me direction when I style a holiday mantel. I enjoy your mantles! My center piece is the mirror. Winter is not my favorite season. I love the first snow. You always come up with the best ideas! You're one talented junker. Each of your mantels are wonderful. It would be hard to choose a favorite. I do love this year's. It is giving me a couple of ideas for my own. Thank you! I LOVE everything about your wonderful mantel, Carlene! The little bucket with your great-grandfather's photo is my favorite...really special! Carlene ... all your mantels are pretty, but my favorite is this year. The old window is a wonderful anchor piece. Nicely arranged and very interesting. I always look forward to seeing your clever ideas. This year's mantel is full of charm. Love the touch of tartan! Happy Holidays! I'm with you - I'm not crazy about winter anymore, unless I can just sit inside and enjoy looking out. 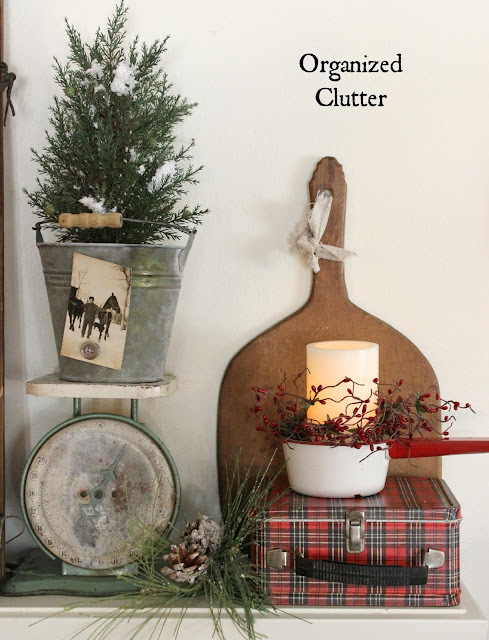 Love your mantel and pinned it! Oh, Carlene, it's absolutely scrumptious. Love the plaid thermoses (thermosi?) It's just lovely. Your Winter Wonderland is gorgeous! They all are! We have a smaller mantle in the family room but I am not quite so adventurous with it, b/c that is 'hubby's room' I don't spend much time in there. I will have to try to think of ways to decorate like that in other parts of the house for me to enjoy. I'm with you....I like to look at the winter wonderland in photos........not outside of my window. I've been stumped as to how to decorate my mantel this year. I've used your ideas from both 2014 and 2015 and it look sensational! Thanks for the inspiration! One of the best mantels I have EVER seen! Carlene, this is stunning! Love,love love your winter wonderland mantel. Just the idea I was looking for after putting the Christmas mantel away. Tomorrow I start my search of a window. Thanks for the idea. Guess I’m going antique shopping.